Hello again from Kitwe! This is the time of year for planting and harvesting. From November we have 5 months of almost daily warm rain and people are able to raise crops without a permanent water supply. 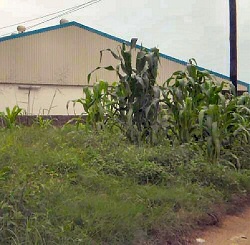 Food is important in Zambia, and everyone who can, either has or rents a field where they can grow the basic staple, maize. Those who are not in that fortunate position will still try and plant where they can, common ground, road verges, in fact any unused land they can find. 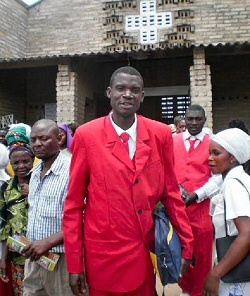 2012 started off for me with an invitation from Moses to attend his inauguration to the men's fellowship at Kawama church on New Year's day. The newly enrolled members are then allowed to wear the traditional red coat of the fellowship, and some go the whole hog with red waistcoats and trousers too! Kawama is about 5 kilometres away, down the very potholed road that leads to Kamatipa. Moses assured me there would be plenty of parking, as leaving the car unsupervised in the road can mean the chance of no windscreen wipers when you return. Turning onto the dirt road that leads to the CatholicTurning onto the dirt road that leads to the CatholicChurch my way was blocked by two busses. I got out and asked where the drivers were, in the hope that one might move his bus. "Still drunk" was the reply from a man who thumbed to the nearest pub, helpfully he did point out another route, which, although a bit of a quagmire, was passable ... just! The "safe" car park also proved a challenge. I had to negotiate a ditch which Moses had failed to mention. There were plenty of willing hands to help me steering in and pushing out of the ditch. I tried to ignore the crunch of the back axle both times, and needless to say mine was the only vehicle in the car park! The service lasted just a little under 4 hours, and about a dozen or so men were initiated into the fellowship. A major event for me this year has been the opening of the Play4All project. This is to serve the children of Kamatipa, by giving them good adult role models and helping educate through play those who cannot afford to go to school. 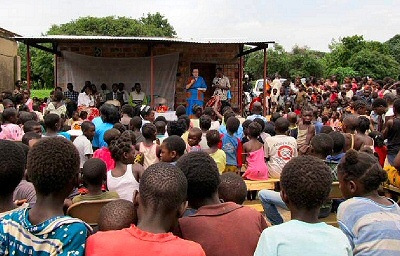 The event, Bemba style, included lots of loud music and an MC; 4 speeches and a vote of thanks. Entertainment in the form of singing and dancing, and poems were provided by the children, the volunteers and the youth group. The youth group also performed a play about the misfortunes of not giving your wife enough money to feed the family as she may run off with someone else! All rounded off with lots of food and drink. Around thirty adults were invited and probably 300 children turned up. (Kamatipa has around 8,000 under 15 years old). 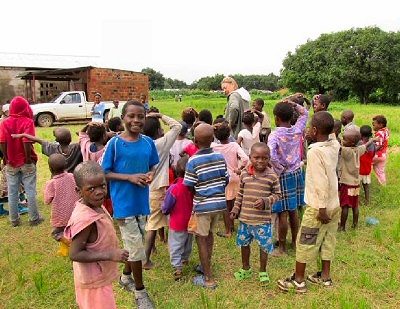 Of course, we had delays, which gave us the opportunity to play games with the children, and when we eventually located the drummers and dancers and brought them to the site we were only about 1.5 hours late starting! Now the official opening is over the real work begins and Ernest and I will be attending three mornings a week for the next couple of months to help get things into a routine. As I mentioned earlier, this is the season for serious planting, and the ladies from lpusukilo have had support to rent a field and plant maize. They literally worked from dawn to dusk hoeing and planting the maize, the main worry for them now is the rats that will eat the young plants. They have tied colourful strips of plastic bags to sticks to try and deter them until the stalks become unpalatable. The enthusiasm of the Play4All volunteers and the children. The Congo seems to have settled down and accepted the 2nd term of Joseph Kabila as president. President Sata has removed the (corrupt) practice of charging for consultations at the local clinics. The Play4All project to become part of community life in Kamatipa and improve the life chances of the children who come. That the governments policies to stem poverty will be effective. The DOWIZA group at Ipusukilo to have a successful harvest in June. For the new intake of ministerial and deaconate students to settle into their studies. 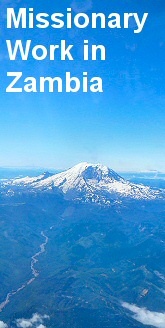 That Zambia will win the Africa Cup of Nations! (Football is very important here! ).